WASHINGTON (May 16, 2016) -- "More than any other crucible, war brings out the worst and best of mankind," said Vice Chief of Staff of the Army Gen. Daniel B. Allyn. "Without question, it is our military medical professionals who reflect the amazing light of creativity, compassion and exquisite care, and it is especially brilliant in these darkest moments." 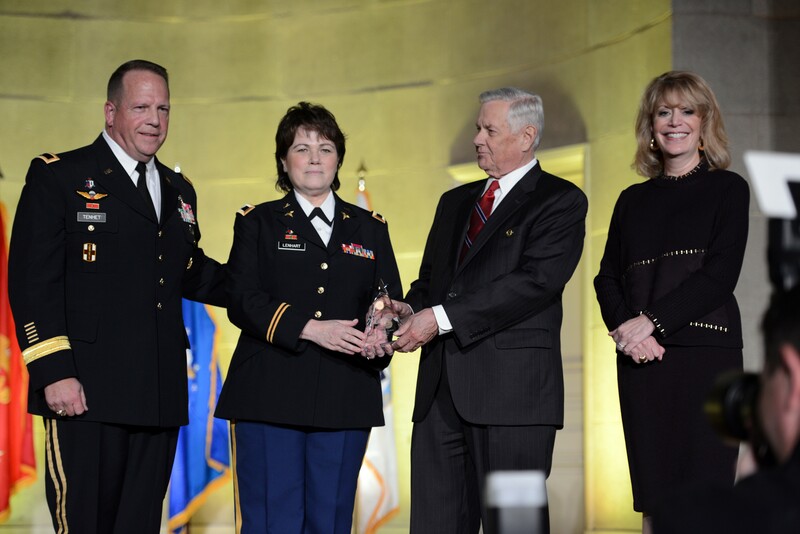 Col. Martha K. Lenhart, MD, PhD, second from the left, was named the U.S. Army Hero of Military Medicine during the 2016 Heroes of Military Medicine Awards, May 5, 2016, in Washington, D.C. On stage with Lenhart are Brig. Gen. Robert D. Tenhet, the deputy surgeon general of the Army and the deputy commanding general (support) of U.S. Army Medical Command, left; John W. Lowe, president and CEO, the Henry M. Jackson Foundation for the Advancement of Military Medicine, Inc., second from right; and Cynthia L. Gilman, vice president, Henry M. Jackson Foundation for the Advancement of Military Medicine, Inc. Center for Public-Private Partnerships, on the right.